Be inspired to gain financial peace, live more, and give more with the biblical principles outlined in these essential Christian Financial Planning books by Dave Ramsey, Larry Burkett, and others. Roughly twenty years ago there was a young couple who were thinking about becoming husband and wife. They earnestly desired to do things “right” and bring glory to God through their life choices. One of those life choices was acknowledging the fact that any money coming their way belonged to the Lord, and that they were called to manage it for Him. The young man took a budgeting class at a local church where they taught biblical principles about money, using materials created by an older, wiser gentleman named Larry Burkett. The young man was inspired by this small, intimate class, and he invited his young wife-to-be to join him for one-on-one personal financial coaching with a precious older couple at that same church. That young couple was us, and those coaching sessions changed the trajectory of our lives. Although Larry Burkett is no longer with us, we still continually search out books and resources that are similar in their message: It’s God’s money, not ours. Living according to this principle enabled us to have financial peace through some pretty rough seasons of life… like when we went without an income for a few months while our new baby was born with health issues, and when our second car was stolen in the middle of winter while our first car was in the shop for engine trouble. God has been so, so faithful in every season. Over the years we’ve found a few books that have, in some way, helped us stay motivated on this journey. 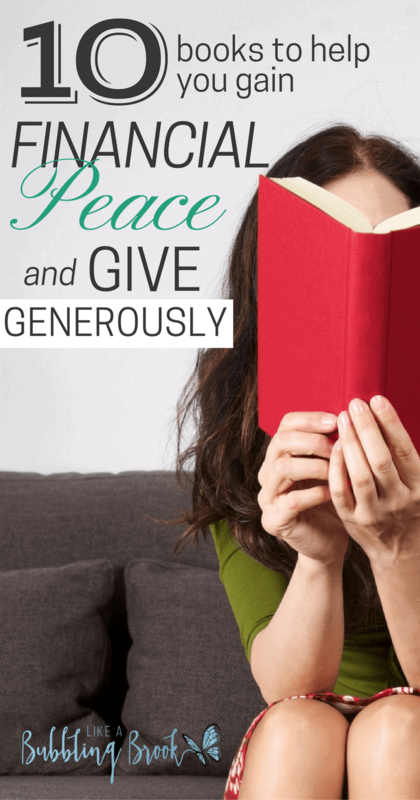 If you want financial peace and the ability to give generously when God prompts you, here’s a list of books that will inspire you. Click on each title to read more about each book. This is a classic, in-depth bible study on money management by Larry Burkett. Inspiration for breaking the debt cycle; this was a bestseller by Larry Burkett. This is a question and answer book about countless financial questions. Great resource to keep in your library. All things retirement… read this one before you get there! What does the bible have to say about wealth and family legacy? This is another christian financial planning book you’ll want to keep in your library. You’ll refer to it often! One of my favorite Dave Ramsey books. Realistic, conservative advice about planning for the second half of life. Read this one before you turn 50, if you can! Full of bible wisdom and co-authored by Larry Burkett and Ron Blue. While we were paying off debt in those early years, I found encouragement in memorizing bible verses about money and thinking through what the bible has to say about money, contentment, and wealth. 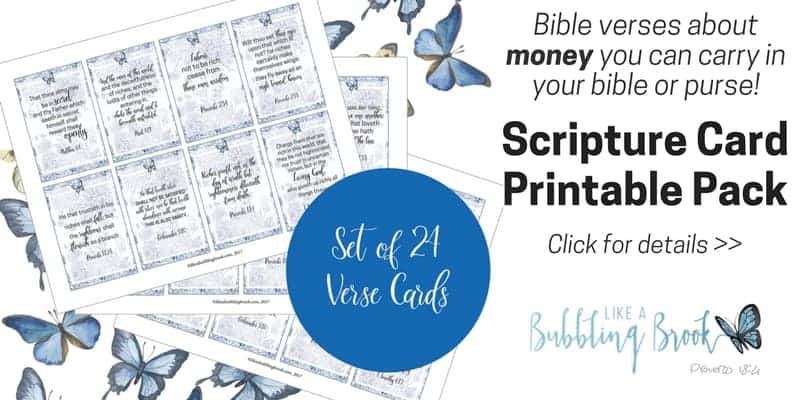 I’ve created these 24 printable scripture cards about money to help you stay inspired, too. They’re perfect for carrying along in your purse or bible and pulling out as you go about your day! What books would you add to this list? Share them in the comments!